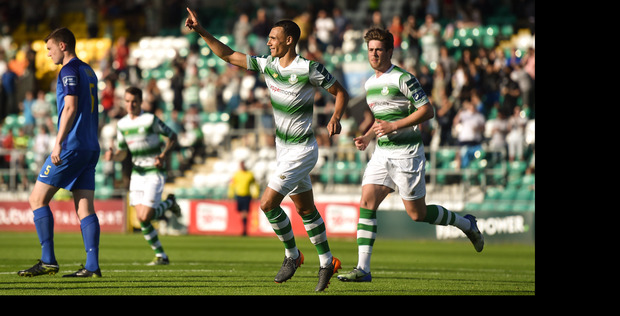 Graham Burke scored twice on his return to a Shamrock Rovers shirt following international duty as the Hoops eased to a facile win over bottom side Bray Wanderers who played virtually the whole match with ten men. With a debut for 16-year-old goalkeeper Gavin Bazunu, Rovers were ahead after four minutes at Tallaght Stadium. Officially managed by Martin Russell for the first time, Bray had central defender Conor Kenna sent off for handling a shot from 17-year-old Brandon Kavanagh on the line. Burke emphatically swept home the resulting penalty. Fellow midfielder Sam Bone cracked home a half volley on 53 minutes to double Rovers’ lead. Latching onto 17-year old Kavanagh’s pass, Burke added their third goal on 75 minute when side-footing home from close range. Dan Carr, with an 83rd minute tap-in, and David McAllister’s low drive from distance four minutes later, completed the rout. Shamrock Rovers: Bazunu; Boyle, O’Brien, Grace, S. Kavanagh; B. Kavanagh (Boyd, 78), G. Bolger (McAllister, 79), Bone (A. Bolger, 73), Coustrain; Burke; Carr. Bray Wanderers: Moran; Gibbons, Kenna, Heaney, Lynch; O’Conor, McKenna; D. Kelly, McCabe (Gorman, 51), Galvin; Coughlan (Pender, 71).